An adverb gives us more information about a verb. It can be in the form of a single word (happily) or in a phrase (in the town) and the term adverbial is often used to describe both forms. Adverbs can be thought of as answering questions, such as How? (manner), Where? (place), When? (time), How often? (frequency), and To what extent? (degree). Other examples are: better, best, early, hard, high, last, late, monthly, near, wide, worse. 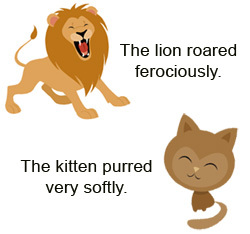 Some adverbs have two forms, one with –ly and one without-ly. These forms have different meanings and uses:e.g. Choose the right adverb in each sentence. Substitute the adverbs on right column for the adverbial phrases in the sentences on left column. Each adverb matches one of the sentences.